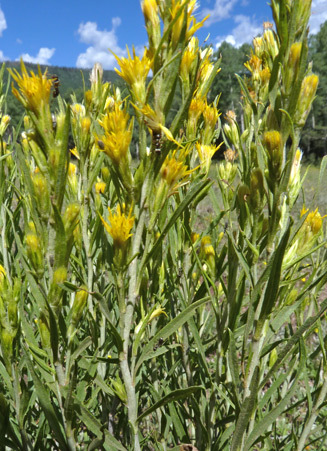 There are a number of Rabbitbrush species in the Four Corners area; the two most common are Ericameria nauseosa and Chrysothamnus viscidiflorus. 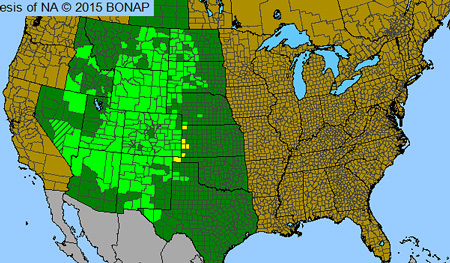 Both have similar habitats and are distributed over very similar elevations. 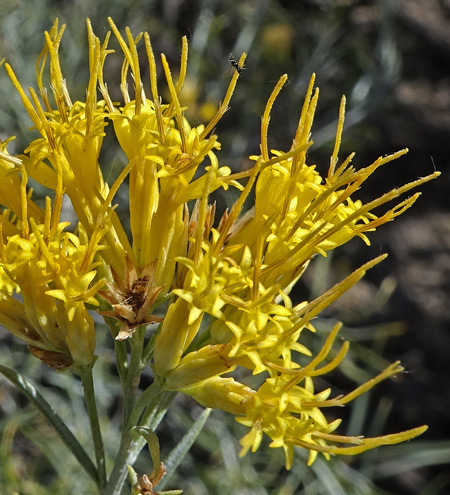 Ericameria nauseosa, the most common Rabbitbrush in our area, often grows seven feet tall and wide. 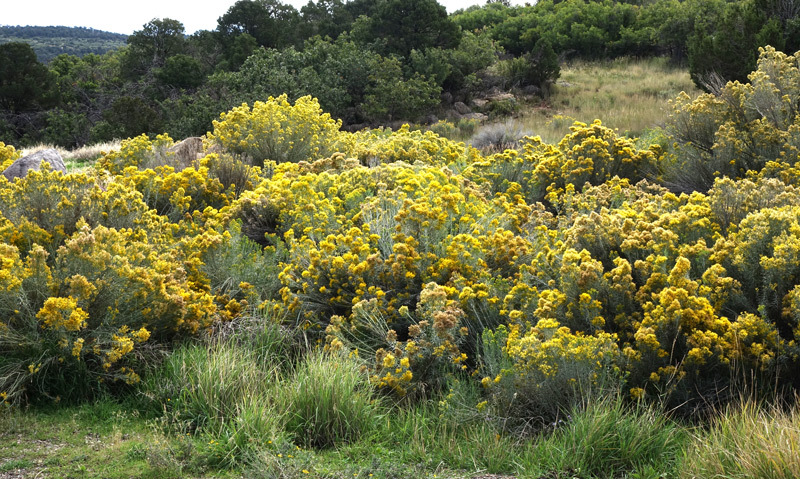 Chrysothamnus viscidiflorus grows to three or four feet tall with a tighter growth pattern; it also is distinguished from other Rabbitbrush species by its (often) sticky flowers and twisted leaves. Ericameria nauseosa is further distinguished from C. viscidiflorus (and most other Ericameria and Chrysothamnus) by the thick, felt-like white hairs covering its young twigs. In fact, some floras separate the Ericameria genus from the Chrysothamnus genus on the basis of the presence or absence of these hairs. It should be noted, though, that with the naked eye, the hairs may not be apparent; the young stems of Ericameria just look white. If you scrape the stem with your fingernail and look at the stem with a hand lens or under a microscope, the scraped up hairs may look like hairs but sometimes they look like a gelatinous mass. 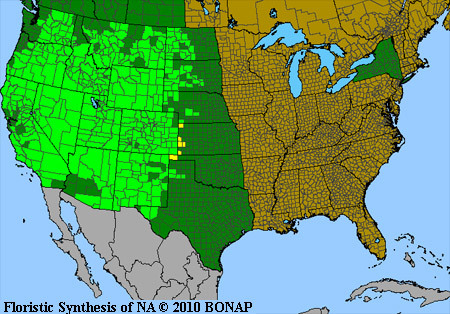 It should also be noted that there are 13 varieties of Ericameria nauseosa in the Four Corners region (and 21 in North America)! 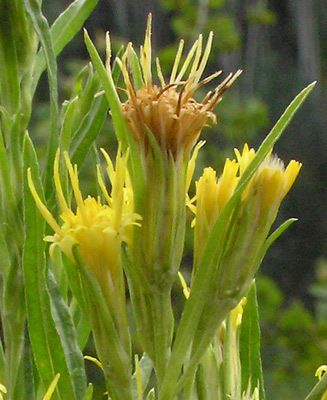 The most common variety in the Four Corners region and through much of the West is graveolens. The Flora of North America separates the Ericameria genus from the Chrysothamnus genus by indicating that the Ericameria genus has phyllaries either equal or unequal in length and these phyllaries are arranged in spirals whereas the Chrysothamnus genus has phyllaries unequal in length and they are arranged in vertical ranks. Several local floras further indicate that Chrysothamnus species have either minutely hairy or glabrous stems; Ericameria species have densely hairy stems (so much so that they appear white). Both E. nauseosa and C. viscidiflorus seed themselves readily and therefore often sprout dozens of bushes in one area. 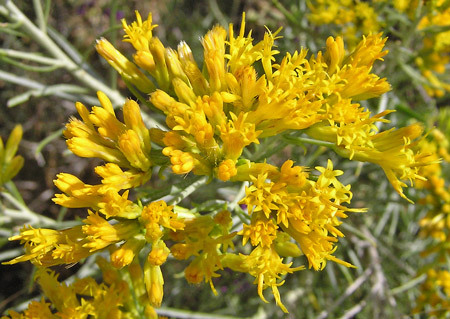 All the Rabbitbrush species shown on this web site are late flowering, usually in late July, August, and September. Then their crowns become a bright golden glow of flowers. This glow gave rise to the Latin name "Chryso" "thamnus", "golden" "bush" which was the name Thomas Nuttall gave this genus in the early 19th century for its "affinity to [the genus] Chrysocoma and brilliant golden yellow flowers." Nuttall also named the Ericameria genus from the Greek "ereike" (heath) and "meris" (part), referring to the heath-like leaves. Gutierrezia sarothrae (Gutierrezia), Petradoria pumila (Rock Goldenrod), and, when young and small, the various species of Chrysothamnus and Ericameria (Rabbitbrushes) are often difficult to tell apart. Click for some assistance. Semi-desert, foothills, montane. Openings, disturbed areas. Fall. Above: McPhee Campground, September 17, 2014. Left: Near Yellowjacket Canyon, August 29, 2004. Ericameria nauseosa is very common in the Four Corners. It seeds itself readily in open, sandy soils and grows very quickly, even in drought times. The pictured shrub is about five feet tall and wide but is just five years old. New blue-green leaves show above the light brown masses of last year's dried flowers. Notice the woody, leafless stems at the bottom. 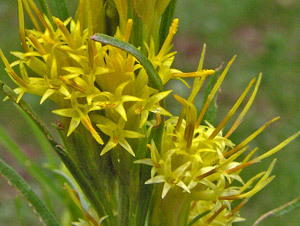 Ericameria nauseosa is, according to Intermountain Flora, "a highly variable species" and the scores of different scientific names given it since 1814, when it was first named Chrysocoma nauseosa, attest to this variability. There are 13 varieties of Ericameria nauseosa in the Four Corners region, with varieties graveolens, oreophila, and speciosa the most wide-spread. These three are also the most wide-spread of the 21 varieties in the West. The first specimens of this plant were collected by Meriwether Lewis along the Missouri River in 1805. Peter Pallas named the plant Chrysocoma nauseosa in Frederick Pursh's 1814 Flora Americae Septentrionalis. Nathaniel Britton named it Chrysothamnus nauseosus in 1898 and Guy Nesom renamed it Ericameria nauseosa in 1993. McPhee Campground, October 2, 2014. Projecting from the long and narrow floral tube are the forked styles with a lower shorter stigma portion and a longer style appendage portion. The relative lengths of the stigma and appendage portions helps to distinguish between Ericameria nauseosa variety graveolens (appendage longer than stigma) and E. nauseosa variety oreophila (appendage shorter than stigma). Welsh's A Utah Flora separates the two varieties on the basis of other characteristics: E. nauseosa variety graveolens has 1-5 nerved leaves (usually 3-5 nerved) that are commonly 1-3 mm wide. E. nauseosa variety oreophila has 1 nerved leaves that are just .5-1.5 mm wide. The length of the corolla lobes also can be helpful: lobes of E. nauseosa variety graveolens are .6-1.5 mm long, those of E. nauseosa variety oreophila are 1.5-2.5 mm long. Near Yellowjacket Canyon, September 23, 2004. 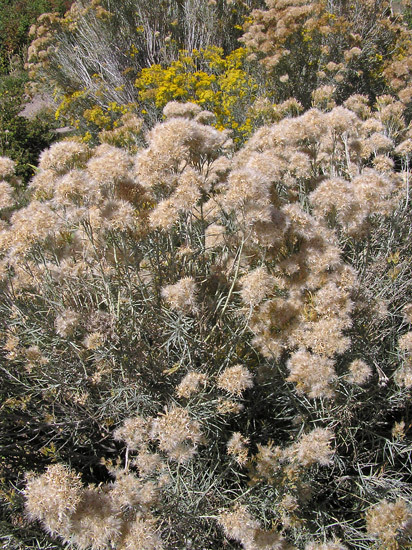 Rabbitbrush in the fall shows a variety of colors and textures: light brown puffs of a myriad of seeds, darker brown older seeds in the back right, fresh flowers in the center, and long light stems in the back center and left. The seeds are eaten by many birds. Near Yellowjacket Canyon, August 28, 2005. 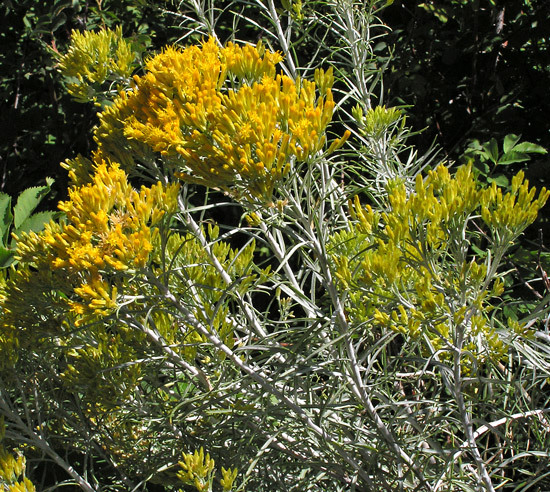 Rabbitbrush upper stems are white from a tightly matted coat of hairs. Often, however, even under magnification the mat does not appear to be made up of hairs. Scrape the coating with your fingers and you will then see a fluff of hairs pulled up. The presence of such hairs, along with several other characteristics, separate the Ericameria genus from the Chrysothamnus genus. Crushed stems and leaves exude a distinctive, sharp, sweet odor. De-Na-Zin/Bisti Wilderness, New Mexico, April 18, 2005. 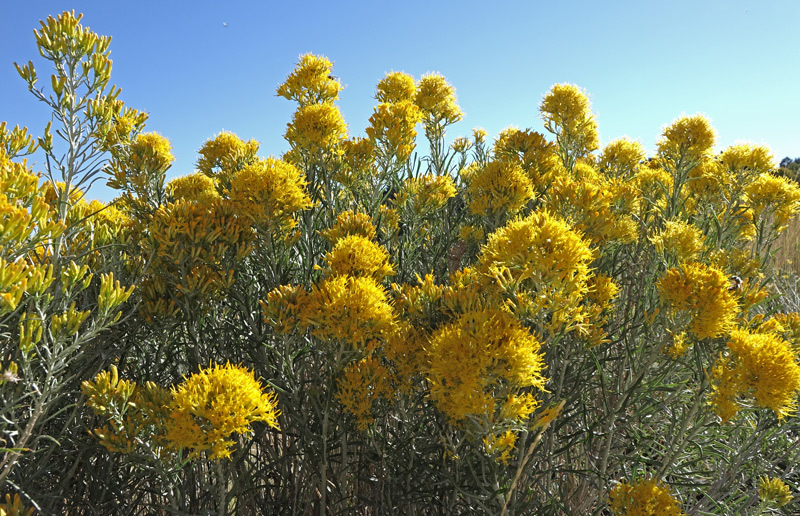 "Close observation of Rabbitbrush (Chrysothamnus [and Ericameria] spp.) may sometimes reveal a few to many cottony swellings about a centimeter in diameter. These are galls caused by several species of small pictured-winged fruit flies (Aciurina spp. of the Family Tephritidae of the Order Diptera). The gall makers over-winter as larvae within the galls. 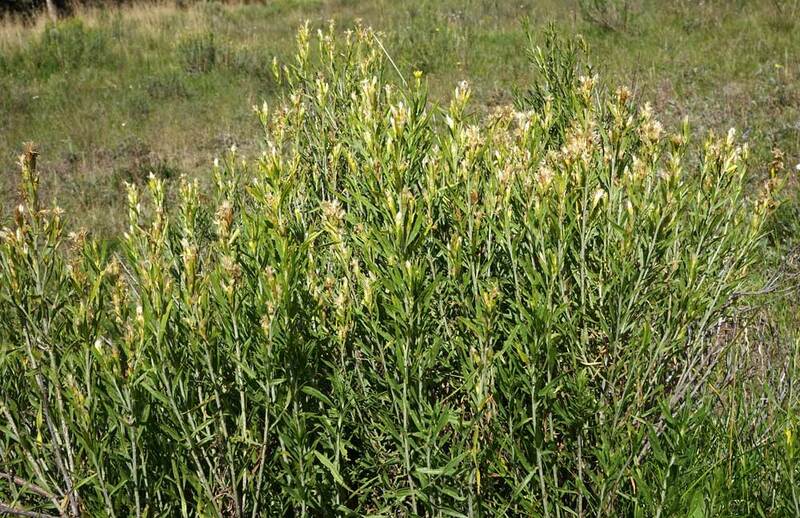 Adults emerge in early summer, mate, and females lay eggs on the rapidly growing Rabbitbrush. 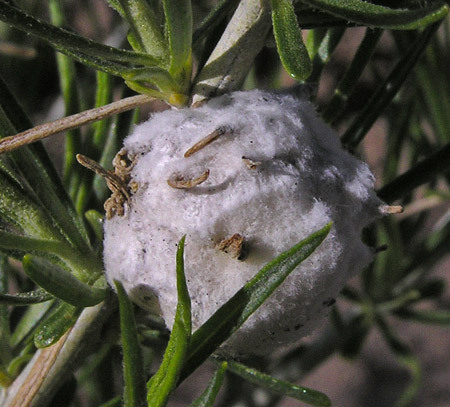 The developing larvae stimulate development of the galls. Several species of small wasps parasitize the larvae to such an extent that the gall makers are generally not considered to be a pest." Foothills, montane. Open woodlands, meadows. Summer, fall. Above: Lower Calico Trail, September 11, 2017. Left: Fish Creek Trail, August 9, 2005. Below: Wildcat Trail, August 28, 2007. Ericameria parryi grows to a bit more than two feet tall and is found at woodland borders and in meadows. Long, narrow, sometimes sticky leaves sometimes spiral, and flowers and flower heads are large compared to other members of the genus. The often sticky phyllaries are 10+ millimeters long and slightly keeled and flowerheads are numerous in spike or raceme-like arrangements. There are a number of subspecies differing in the number of flowers per head, the hairiness of the leaves and stems, the height of the plant, etc. 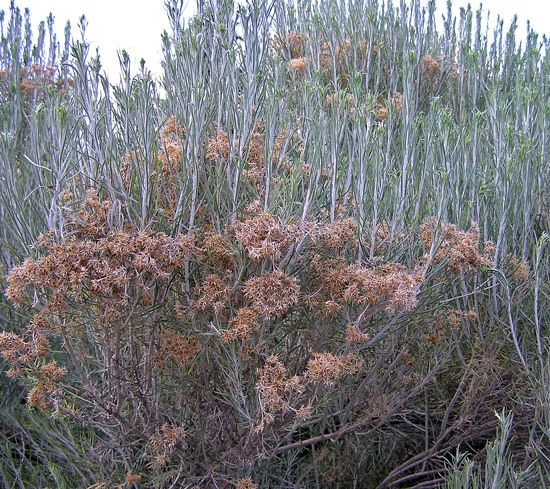 The photograph above shows Ericameria parryi just after flowering and you can see that the top of the shrub had an abundance of flowers, as is typical of not only this species, but all the Ericameria and Chrysothamnus species. Fish Creek Trail, August 9, 2005 and Lower Calico Trail, July 30, 2013. Phyllaries, the light green structures that surround the side of each flower cluster, are divided into two types: the outer phyllaries are long, narrow, and taper to a point; the inner are shorter and usually light green to papery-white; both are only slightly keeled, i.e., humped or raised like a ship's keel and both inner and outer phyllaries are often sticky. Branches of Ericameria parryi have an upright posture. 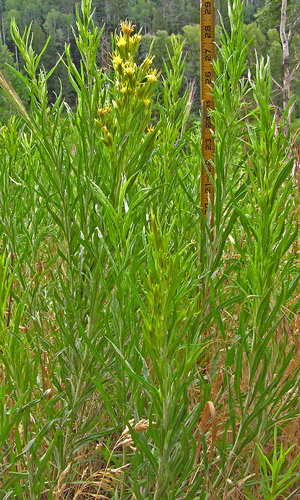 Note the light stem color, a characteristic due to abundant hairs which are usually present on this species and E. nauseosa, but not on the other species of Ericameria and Chrysothamnus in the Four Corners region.